IPTV testing is the performing of measurements or observations of a device, system or service that provides television service through data networks to validate its successful operation and/or performance. IPTV testing can be complicated because there are many interrelated processes which all can reduce the quality of the media and processes that are used to control the media flow. IPTV systems differ from broadcast television systems as they use transmission systems that provide varying levels of performance. Broadcast systems are designed for controlled continuous transmission while IPTV systems use packet transmission that is subject to varying transmission patterns and packet losses (burst errors). IPTV systems use switched video service (SVS) that dynamically setup (on demand) video signal connections between two or more points. SVS services can range from the setup of data connections that allow video transfer to the organization and management of video content and the delivery of video programs. This figure shows how a basic IP television system can be used to allow a viewer to have access to many different media sources. This diagram shows how a standard television is connected to a set top box (STB) that converts IP video into standard television signals. The STB is the gateway to an IP video switching system. 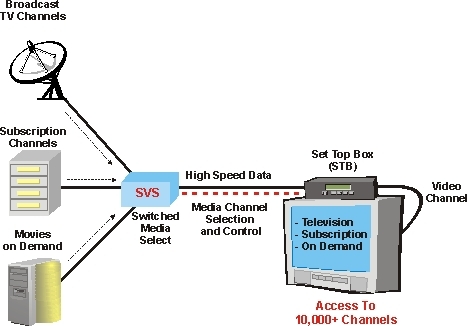 This example shows that the switched video service (SVS) system allows the user to connect to various types of television media sources including broadcast network channels, subscription services, and movies on demand. When the user desires to access these media sources, the control commands (usually entered by the user with a television remote control) are sent to the SVS and the SVS determines which media source the user desires to connect to. This diagram shows that the user only needs one video channel to the SVS to have access to virtually an unlimited number of video sources. IPTV systems can be divided into multiple layers ranging from a layer that physically transports data to the layer that presents the media to the viewer. The divisions of the hierarchy are referred to as layers or levels, with each layer performing a specific task. In addition, each protocol layer obtains services from the protocol layer below it and performs services to the protocol layer above it. The physical layer is responsible for converting bits of information into data packets that are transferred on a network. The MAC layer is responsible for requesting and coordinating access to the physical channel. The Internet protocol (IP) layer is responsible for adding the network address to packets so they can travel through the network to reach their destination. The transport layer is responsible for transferring packets (such as UDP/RTP) between the sender and the receiver. The session layer coordinates and oversees that transfer of the media components for the program channel (such as MPEG). The packet elementary stream (PES) layer maps and coordinates the media components to the transport streams. The application layer coordinates the information interface between the communication device and the end user or the program they are using. This figure shows an IPTV system that has been divided into multiple layers. The physical layer is responsible for converting bits of information into data packets that are transferred on a network. The MAC layer is responsible for requesting access and coordinating the flow of information. The Internet protocol (IP) layer is responsible for adding the network address to packets. The UDP/RTP (transport layer) is responsible for transferring packets between the sender and the receiver. The MPEG transport stream layer combines multiple media streams (audio and video) into a single program transport stream. 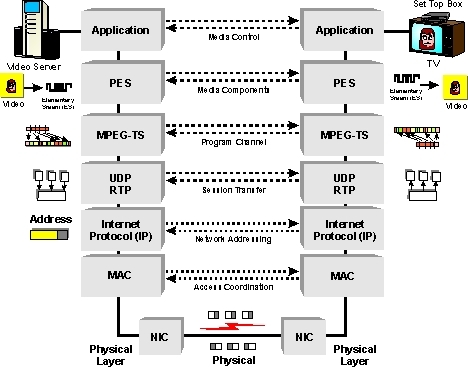 The PES layer assigns media components (such as audio and video) to specific packet streams. The application layer presents the media to the viewer. The operation of IPTV systems is commonly measured by a combination of objective quality of service (QoS) and quality of experience (QoE) evaluation processes. Quality of service (QoS) is one or more measurements of desired performance and priorities of a communications system. QoS measures may include service availability, maximum bit error rate (BER), minimum committed bit rate (CBR) and other measurements that are used to ensure quality communications service. Quality of experience (QoE) is one or more measurements of the total communications experience or the entertainment satisfaction from the perspective of the end user. QoE measures may include service availability, audio and video fidelity, types of programming, ability to use and the value of interactive services. This book covers quantitative (packet loss, error rate) and qualitative (perceptual) quality measurement and control processes used in IPTV systems. Quality measurement processes such as MDI, V-Factor, synchronization, interaction (control), and other measurable values are explained. Network probes, STB test client software, and multilayer testing are described.